"There are many spirits in the hall today. If you are psychic, you can see them..."
Those were among some of the opening words uttered by feng shui expert and world's best-selling feng shui writer Lillian Too during her Spiritual Feng Shui Seminar at the Gardens Hotel Ballroom in KL on the 28th July 2013. It was a full day event and a very interesting one too! Interesting because for the very first time in Malaysia, Lillian Too were talking with us about ghosts, spirits and the cosmic world! 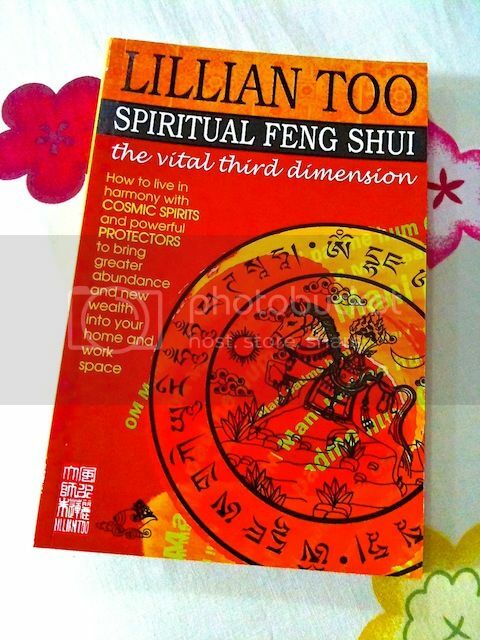 If you are wondering why I took such a long time to blog about this event, well, that's because I had wanted to first read Lillian's ground-breaking new book called Spiritual Feng Shui - The Vital Third Dimension. I needed to gather my thoughts too before writing this post as there were simply too many things to mention. It would be highly impossible for me to reveal every single thing that Lillian had talked about that day. So I shall just try to keep it simple and to the point. But first, what is Spiritual Feng Shui? 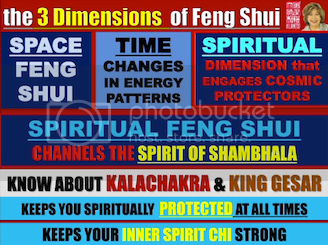 If you think Spiritual Feng Shui is all about ghosts and spirits, you are not very far behind. Yes, it's about that and more. Googling about this topic did not prove to be very helpful. There were not many websites or information on the Internet regarding Spiritual Feng Shui. In Lillian Too's own words, Spiritual Feng Shui is about engaging the spirits around us and living in harmony with them. If this sounds scary to you, Lillian made it worse initially by saying that not everyone can see these spirits (although she can), but it's better not to see them because some of them look very fearsome and horrific. Yikes!! However, she was quick to tell us that first and foremost, we must NOT be afraid. Ghosts and spirits - they do exist - but we must not be scared of them. She also dispelled fears that this was about religion, that we need to convert to Buddhism to practise Spiritual Feng Shui. Instead, Spiritual Feng Shui has nothing to do with religion, but more about having faith in oneself. For the uninitiated, there are basically three dimensions to the practice of feng shui. They are the Space dimension, Time dimension and Spiritual dimension. Most of us who study feng shui or have some interest in feng shui are already familiar with the first two dimensions ie. Space and Time feng shui. Honestly, I had no idea about the third dimension ie. the Spiritual dimension until Lillian mentioned briefly about it during her Feng Shui Extravaganza in KL back in 2011. However, Spiritual Feng Shui is not a new fad or something that Lillian just discovered by accident. It was in fact, being practised by many good old feng shui practitioners especially in Hong Kong - it's just that they never talk or reveal about it. When Lillian was at the height of her career in Hong Kong back in the olden days, she noticed that many developers called in the feng shui master before they start construction work on a new building. Many thought the feng shui master was there to do the Space and Time feng shui but the truth of the matter is, he was there to bless the land and appease the spirits so that the construction could continue without any obstacles. We have often heard about accidents and deaths happening at construction sites. Could it be that the developers had offended the spirits of the land and the surroundings when they started to dig and build? According to Lillian, the REAL secrets to feng shui is neither the Space nor the Time dimension as practised by many modern feng shui practitioners today, but the Spiritual dimension. To her, Space feng shui is easy. It's all about compass directions, landscape, formulas, the art of placement of furniture and decorative objects, and arranging your physical space to improve the energy flow. When she first started writing her first feng shui book more than 15 years ago, Lillian talked mainly about Space feng shui. Later, when people were familiar with Space feng shui, Lillian started to introduce Time feng shui in her books. Time feng shui is about the changes in energy with the passing of time. Most of us who were practicing Space feng shui began to realize that energy changes with time and does not stay the same forever. In other words, we have to keep updating our feng shui from time to time. Unbeknownst to many, Lillian was already practising all three dimensions of feng shui long before that. Her meeting with Lama Zopa Rinpoche in India in 1997 was also the turning point where her interest in Spiritual feng shui was fuelled. From this very high lama of Tibetan Buddhism, she learnt many things that helped her share with us all the secrets of Spiritual Feng Shui. According to Lillian, it was difficult to talk about Spiritual Feng Shui. Writing the book on Spiritual Feng Shui was not easy. A lot of research and years of disciplined practice were necessary before she could bring herself to share with others. I certainly have no regrets attending her seminar as I think she had successfully put it all together in a way that is comprehensive and easy to understand for the layman. During the seminar, Lillian explained the powerful role of Spiritual Feng Shui - how it enhances the Space and Time dimensions so that our practice of feng shui is complete and is more effective. There were some interesting moments when she said she could feel the energy of the hall was very heavy as if it was crowded with spirits who were also there to listen to her talk. Lillian said this always happens when she gives all her feng shui talks. To our amusement, Lillian then proceeded to ask the spirits to give her some space, so as to lighten up the energy in the hall. Next, Lillian introduced us to the topic of King Gesar and the Spirits of Shambhala. She equated Spiritual Feng Shui with the Spirits of Shambhala. To the Tibetans, Shambhala is a mystical paradise that is supposed to be located somewhere in Central Asia. King Gesar is the King of Shambhala. King Gesar is also widely revered as a manifestation of the 4 Buddhas - the great Guru Rinpoche, Avalokiteshvara (the Buddha of Compassion), Vajrapani (the Buddha of Power) and Manjushri (the Buddha of Wisdom). Invoking King Gesar and chanelling the Spirit of Shambhala will help you fend off evil forces and learn profound spiritual truths. It also make your inner spirit essence or 'lung ta' strong. A strong inner spirit will prevent you from getting bad luck, being disturbed by spirits and falling victim to black magic! Lillian also mentioned about the Kalachakra symbol. It is a principal protective symbol that keeps you safe. When worn, the Kalachakra can be seen by spirits and they will leave you alone. Lillian mentioned that The Dalai Lama, who is considered a warrior of Shambhala, has been spreading the knowledge of the Kalachakra to the world. 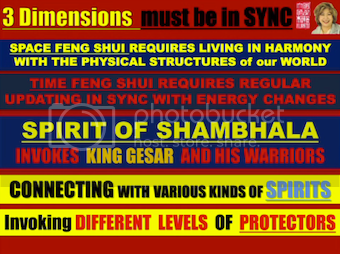 Spiritual Feng Shui involves connecting with various kinds of spirits and invoking different levels of Protectors. How do we connect with the spirits? How do we invoke the cosmic protectors to protect us from harm? Lillian promised to teach us that day. But before that, we need to know who these spirits and protectors are. We need to understand how the cosmic realms work. And THIS is where it got really interesting. Don't miss Part 2 where I will share with you what Lillian Too taught us about the parallel worlds and the different realms of existence.